Creates Store entry, fills it using action's fillEntry(), and Comm-writes it using parent StoreToCommWriter. Definition at line 22 of file ActionWriter.h. Definition at line 19 of file ActionWriter.cc. References action, debugs, and HERE(). Definition at line 161 of file StoreToCommWriter.cc. References Mgr::StoreToCommWriter::clientConnection, Comm::Connection::close(), and Comm::IsConnOpen(). Definition at line 43 of file StoreToCommWriter.cc. References Mgr::StoreToCommWriter::clientConnection, Comm::Connection::close(), Mgr::StoreToCommWriter::closer, comm_remove_close_handler(), Comm::Connection::fd, Comm::IsConnOpen(), and NULL. 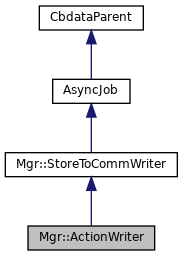 Referenced by Mgr::StoreToCommWriter::swanSong(), and Mgr::StoreToCommWriter::~StoreToCommWriter(). Definition at line 153 of file StoreToCommWriter.cc. References Mgr::StoreToCommWriter::entry, StoreEntry::objectLen(), STORE_OK, StoreEntry::store_status, and Mgr::StoreToCommWriter::writeOffset. Referenced by Mgr::StoreToCommWriter::noteCommWrote(), and Mgr::StoreToCommWriter::noteStoreCopied(). Definition at line 129 of file StoreToCommWriter.cc. References Mgr::StoreToCommWriter::clientConnection, debugs, HERE(), Comm::IsConnOpen(), Must, and AsyncJob::mustStop(). Definition at line 117 of file StoreToCommWriter.cc. References Mgr::StoreToCommWriter::clientConnection, debugs, Mgr::StoreToCommWriter::doneAll(), CommCommonCbParams::fd, Comm::Connection::fd, CommCommonCbParams::flag, HERE(), Must, NULL, Comm::OK, Mgr::StoreToCommWriter::scheduleStoreCopy(), CommIoCbParams::size, and Mgr::StoreToCommWriter::writeOffset. Definition at line 92 of file StoreToCommWriter.cc. References debugs, Mgr::StoreToCommWriter::doneAll(), StoreIOBuffer::error, StoreIOBuffer::flags, HERE(), StoreIOBuffer::length, Must, and Mgr::StoreToCommWriter::scheduleCommWrite(). Definition at line 79 of file StoreToCommWriter.cc. References asyncCall(), data, Must, Mgr::StoreToCommWriter::noteStoreCopied(), NULL, and ScheduleCallHere. Definition at line 103 of file StoreToCommWriter.cc. References asyncCall(), Mgr::StoreToCommWriter::clientConnection, StoreIOBuffer::data, debugs, HERE(), Comm::IsConnOpen(), StoreIOBuffer::length, Must, Mgr::StoreToCommWriter::noteCommWrote(), NULL, and Comm::Write(). Definition at line 69 of file StoreToCommWriter.cc. References Mgr::StoreToCommWriter::buffer, debugs, Mgr::StoreToCommWriter::entry, HERE(), Must, Mgr::StoreToCommWriter::NoteStoreCopied(), NULL, Mgr::StoreToCommWriter::sc, storeClientCopy(), and Mgr::StoreToCommWriter::writeOffset. Referenced by Mgr::StoreToCommWriter::noteCommWrote(), and Mgr::StoreToCommWriter::start(). Definition at line 27 of file ActionWriter.cc. References action, debugs, Mgr::StoreToCommWriter::entry, HERE(), Must, NULL, and Mgr::StoreToCommWriter::start(). Definition at line 137 of file StoreToCommWriter.cc. References Mgr::StoreToCommWriter::close(), debugs, Mgr::StoreToCommWriter::entry, HERE(), NULL, Mgr::StoreToCommWriter::sc, storeUnregister(), StoreEntry::unlock(), and StoreEntry::unregisterAbort(). Definition at line 34 of file ActionWriter.h. Referenced by ActionWriter(), and start(). Definition at line 68 of file StoreToCommWriter.h. Definition at line 61 of file StoreToCommWriter.h. Referenced by Mgr::StoreToCommWriter::Abort(), Mgr::StoreToCommWriter::close(), Mgr::StoreToCommWriter::noteCommClosed(), Mgr::StoreToCommWriter::noteCommWrote(), Mgr::StoreToCommWriter::scheduleCommWrite(), Mgr::StoreToCommWriter::start(), and Mgr::StoreToCommWriter::StoreToCommWriter(). Definition at line 67 of file StoreToCommWriter.h. Referenced by Mgr::StoreToCommWriter::close(), and Mgr::StoreToCommWriter::StoreToCommWriter(). Definition at line 63 of file StoreToCommWriter.h. Referenced by Mgr::StoreToCommWriter::doneAll(), Mgr::StoreToCommWriter::scheduleStoreCopy(), start(), Mgr::Filler::start(), Mgr::StoreToCommWriter::start(), Mgr::StoreToCommWriter::swanSong(), and Mgr::StoreToCommWriter::~StoreToCommWriter(). Definition at line 64 of file StoreToCommWriter.h. Referenced by Mgr::StoreToCommWriter::scheduleStoreCopy(), Mgr::StoreToCommWriter::start(), Mgr::StoreToCommWriter::swanSong(), and Mgr::StoreToCommWriter::~StoreToCommWriter(). Definition at line 65 of file StoreToCommWriter.h. Referenced by Mgr::StoreToCommWriter::doneAll(), Mgr::StoreToCommWriter::noteCommWrote(), and Mgr::StoreToCommWriter::scheduleStoreCopy().